1. This year I got accepted to my first FitFluential campaigns! Then I reviewed the Koss FitSeries earphones. Running with Ollie about getting into triathlons. The Sarcasm Goddess, who made me a member of her Super Secret Society of Awesome Goddesses but maybe I'm not supposed to tell you that. It was all about how I got to be the way I am. Real World Weight Loss about finding your motivation. 3. I made a video. I'm going to make you click the link if you want to see it. 4. I was fortunate to get free entries/race ambassadorships for the two sprint triathlons I raced this year. and the Athleta Iron Girl. 5. I tried Bikram Yoga. 6. My sister forced me to go to Shred with her. 8. I got to join the Tough Chik team with my friends Erika and Christy! 9. I was nominated for Hilarious Health Activist at Wego Health (It's easy to endorse me with one click and you can vote once a day through all of January--there are lots of great people to vote for in lots of categories!) Thank you for all the votes so far!! 10. My blog turned 3 years old. 11. I ran two 5ks, one of which I PRed (race recap still to come), and the Ottawa Race Weekend run with my sister and nephews. And my sister became a runner! 12. I ran the Heroes Half Marathon and got a PR, thanks to Erika pacing me! 13. I. Ran. A MARATHON!! Sharing more about the people who inspire me to crush my goals. 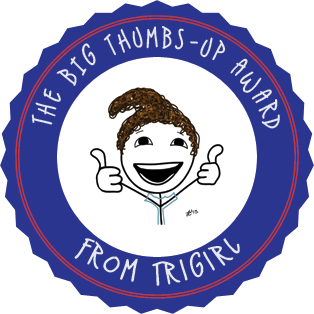 Look for more Thumbs Up posts next year...you just might find yourself in one of them!! Hmm, I know, I probably should. But it's my last day of vacation. What?!?!?! You ran a MARATHON?!!!!!! Tell me MORE!! Sounds like 2013 was pretty amazing. I hope that 2014 is even better! I know, I like to keep it under my hat ;) Hooray for more tris!! Thank you so much for the offer to pace me! I'm going to aim for the Heroes Half in April, so if you're up for it let me know!! More!! Sounds like a great plan for 2014. Congrats on all you accomplished in 2013. You rock. Nice. I think this year I managed to not die. I think that's an accomplishment. I think? This year I resolve to not make resolutions. Awww crap. Yeah, it is an accomplishment. Don't you hate resolutions? You have had a great year! Hope your 2014 is even more awesome! Thanks Christy! It's always nice to look back and see how much actually happened! What a great year! I can't wait to see what's in store for you in 2014. Happy New Year! thanks Angela! I'm now pondering an olympic tri...hmm. just with stick figures, right?? Thanks so much Alyse! I'm planning on *big* things! How did I not know you ran in Paris?!?! My favorite place ever! I've run the Paris Marathon twice! You deserve every good thing that as happened to you and your blog. I wishing you a happy, healthy, and funny 2014! I haven't posted about Paris yet :) You are so sweet! Maybe we might get a chance to meet this year! Stick to it with your posts, drawings, and hilarity. Ha ha ha Cracking myself up here! stick figures. Get it. Anyway, I look forward to enjoying your posts even more in 2014 you busy athlete!